BEIJING, China -- The biggest ever repair programme at two palaces belonging to the Dalai Lamas and at an ancient lamasery in the Tibet Autonomous Region are in full swing and are expected to be finished next year. The 330-million-yuan (US$40 million) renovation programme, which was started in 2002, will help prevent the 1,300-year-old Potala Palace, the Winter Palace of the Dalai Lamas, from being eroded by wind and eaten by worms and rats. 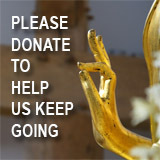 Also on the list for repairs are the Norbuglinkha, the summer resort of the Dalai Lamas, and the Sagya Lamasery, which contains numerous rare religious relics, according to Xin Gaosuo, deputy director of the region's Cultural Bureau. He said the central and regional governments have also jointly allocated more than 100 million yuan (US$12 million) to renovate old ordinary residential buildings in Lhasa, the regional capital, in order to bring back the original flavour of the old city. The white-and-maroon Potala Palace, perched atop a craggy hill that dominates Lhasa's skyline, was built in the seventh century and enlarged in the 17th century. The stone-wood compound is considered a model of traditional Tibetan architecture. The on-going renovation project is the second phase of repairs being carried out on the 117-metre-tall palace, where problems such as subsidence, an infestation of moths and damage to frescoes have occurred, said Xin. The first phase of renovation on the palace was carried out in 1989 at a cost of 55 million yuan (US$6.7 million) and took five years to complete. Champa Kalsang, head of the Potala Palace Administration Office, said many Tibetan craftsmen participated in the renovation of the ancient buildings. He said he believed that since all the repairs were conducted on the basis of retaining the palace's original appearance, its historical and cultural value would not be sacrificed in the repairs. Situated in the western suburbs of Lhasa, Norbuglinkha was built in the middle of the 18th century and served as the summer palace of the Dalai Lamas. It was where they handled political affairs, practised religious activities and spent their holidays. 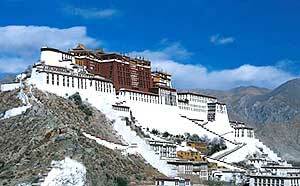 Both the Potala Palace and Norbuglinkha have been listed as World Heritage Sites. The third major structure under renovation is the Sagya Lamasery, which has been dubbed the second Dunhuang Grottoes because of its huge collection of Buddhist scriptures. It also has priceless porcelain and vivid murals dating back nearly 1,000 years. A large number of murals have begun to crack or blister. "Rehabilitation of the murals is one of the most technically demanding tasks in the renovation," said Xin.